Willowmere cottage - Absolute lake edge. Our cottage, on the Western shores of Lake Rotorua, is only 8kms from Rotorua City and it's attractions. An acre of park like grounds provides plenty of off road secure parking and plenty of space for children to play. 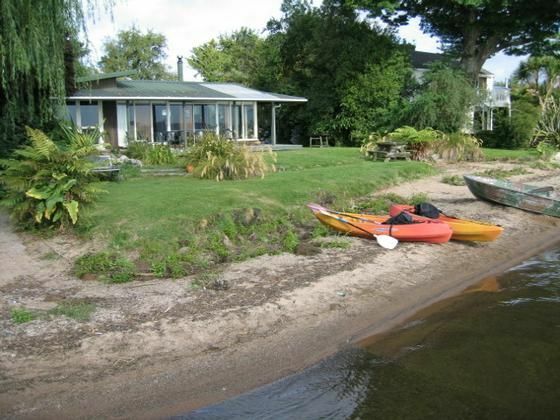 A safe sandy beach and kayaks make this an ideal holiday retreat. The cottage is spacious, well equipped and comfortable. It has a modern bathroom, full kitchen facilities including two fridges/freezers and microwave, a walk-in store room, wood burning fire, T.V. VCR, DVD, Sky TV, CD player, washing machine, gas BBQ and free wifi. Ngongotaha village is 5 mins away. It has a post office, wine shops, a supermarket, a hardware shop, bakeries and dairies, a service station, a tavern etc. Local attractions are plentiful... trout fishing, Agrodome, Agroventures, Zorb, Rainbow Springs, Horse riding, Fish and Game Trout Hatchery, Wingspan, golf courses, mountain bike trails, etc. Please note that use of the sleepout is on request only. Hi. Family of four (2 kids under 8) had a great stay and enjoyed the location by the lake and the use of the kayaks. As other reviews have noted the bach is older, but good fun. Only suggestion for improvement would be there are some mice / rodents in the ceiling cavity above the kitchen, and a larger / fan heater would be welcome for the main living area as it was cold when we arrived and the log fire needs some time to warm up before it really starts working. Fantastic accommodation which has everything a family needs. The use of the sleepout was fantastic. The kayaks and life jackets made the experience complete and the kids didn't want to leave. Amazing communication with the property manager made our trip a breeze. Perfect location, wonderful sun. Rooms are a good size with fantastic flow from living areas to backyard and lake. A slight negative is the low hot water pressure in the sleepout shower. We had a wonderful time and would love to go back again. So lovely to stay on the lake. Loved the location (just over 10 minutes to the city) loved the privacy and having our own bit of lake front (kayaks everyday despite the dodgy weather), the house was comfortable and had everything we needed. The only negative was we were a bit put off by ants in a couple of internal walls and a dampness problem in the sleep out. Loved the accommodation, close to water, had everything we needed!